Importance of Coordination - Why Co-ordination is Necessary? Post: Gaurav Akrani. Date: 5/20/2011. Comment (1). Label: Management. Coordination means to integrate (bring together) all the activities of an organization. It is done for achieving the goals of the organization. There must be proper co-ordination throughout the organization. "Coordination is the Essence of Management." I.e. Coordination affects all the functions of management, viz., Planning, Organizing, Staffing, etc. Coordination is a function of management. Coordination is a principle of management, and all other principles are included in this one principle, i.e. Co-ordination is the "Mother Principle". According to Mary Parker Follett, Coordination is the "Plus-value of the group". That is, if there is good Co-ordination then the combined group achievement will be greater than the total of the individual achievement, i.e. 2+2=5. This is impossible in the physical world, but it is possible in human affairs through co-ordination. It improves goodwill of the organization. There exists many conflicts and rivalries between individuals, departments, between a line and staff, etc. Similarly, conflicts are also between individual objectives and organizational objectives. Coordination arranges the work and the objectives in such a way that there are minimum conflicts and rivalries. It encourages the employees to work as a team and achieve the common objectives of the organization. This increases the team spirit of the employees. There are many departments in the organization. Each department performs different activities. Coordination integrates (bring together) these activities for achieving the common goals or objectives of the organization. Thus, coordination gives proper direction to all the departments of the organization. Coordination gives complete freedom to the employees. It encourages the employees to show initiative. It also gives them many financial and non-financial incentives. Therefore, the employees get job satisfaction, and they are motivated to perform better. 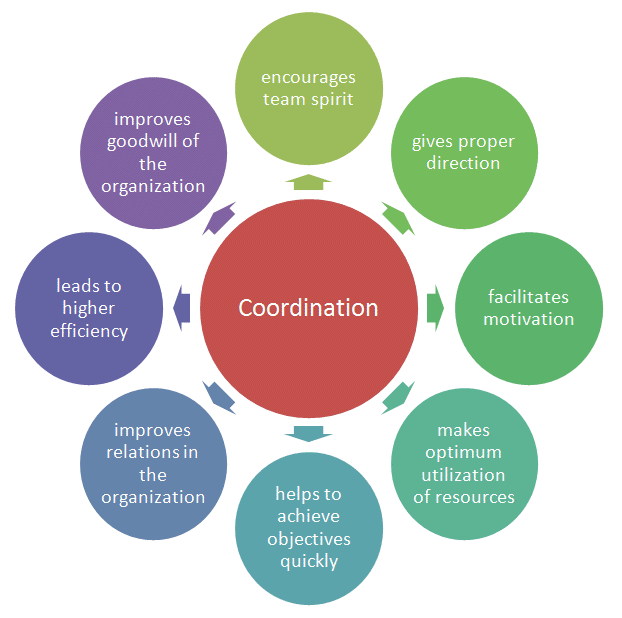 Coordination helps to bring together the human and material resources of the organization. It helps to make optimum utilization of resources. These resources are used to achieve the objectives of the organization. Coordination also minimizes the wastage of resources in the organization. Coordination helps to minimize the conflicts, rivalries, wastages, delays and other organizational problems. It ensures smooth working of the organization. Therefore, with the help of coordination an organization can achieve its objectives easily and quickly. The Top Level Managers coordinates the activities of the Middle Level Managers and develop good relations with them. Similarly, the Middle Level Managers coordinate the activities of the Lower Level Managers and develop good relations with them. Also, the Lower Level Managers coordinate the activities of the workers and develop good relations with them. Thus, coordination, overall improves the relations in the organization. Efficiency is the relationship between Returns and Cost. There will be higher efficiency when the returns are more and the cost is less. Since coordination leads to optimum utilization of resources it results in more returns and low cost. Thus, coordination leads to higher efficiency. Coordination helps an organization to sell high quality goods and services at lower prices. This improves the goodwill of the organization and helps it earn a good name and image in the market and corporate world.